Do You Really Think You Know Mother Goose? For five centuries, Mother Goose has brought pleasure to young and old. 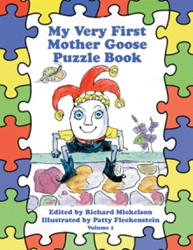 In “My Very First Mother Goose Puzzle Book” (published by Archway Publishing), author Richard Mickelson brings Mother Goose nursery rhymes to the world of puzzle solving. Many challenges await the readers and listeners who dare to get involved. The book is available for purchase at: https://www.archwaypublishing.com/Bookstore/BookDetail.aspx?Book=761119. “You will be amazed at the delightful illustrations and fascinating questions designed to capture the hearts of those ages 2 and beyond,” says Mickelson, adding, “Mother Goose is and always will be part of many homes in schools throughout the world.” The volume includes an introduction that briefly goes over the history of Mother Goose and the impact the character has had. Written for readers of all ages, “My Very First Mother Goose Puzzle Book” tasks readers with answering the many questions throughout the book. Mickelson hopes this will heighten the enjoyment of learning these traditional nursery rhymes. Mother Goose, as we know her, is more than 500 years old. She dates back to the mid-seventeenth century and came to America in 1787 — the year the United States Constitution was signed. Richard Mickelson was born and raised in farm country and worked farmland growing up. The author shares many of his experiences in his writings. He is the author of a number of books, including “The Wizard of Oz, Where Is He Now?” and “The Frog Who Jumped Over the Moon.